Dubai, February 26, 2019: Al-Futtaim Honda, the exclusive distributor of Honda cars, bikes, marine engines and power products in the UAE, recently hosted its first bike ride event for 2019 - ‘Born To Ride’ which saw the Honda biking community turn up in full force. The bikers began the 150km ride from the Honda showroom on Sheikh Zayed Road, Dubai. 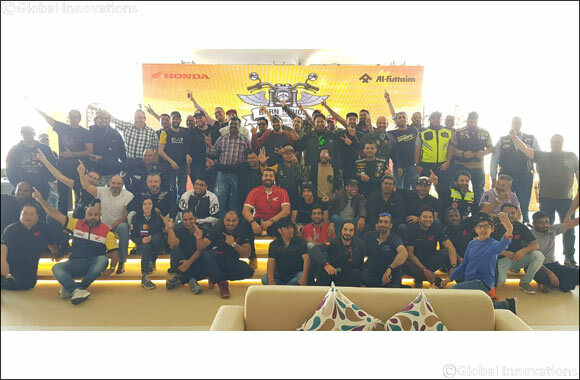 Their first stop was the Al-Futtaim Honda Umm Al Nar showroom in Abu Dhabi where they were joined by riders from the Capital. After a short showroom tour, the riders set course for Al Hudayriat Island, Abu Dhabi where they were welcomed with breakfast and refreshments.